You might be asking yourself "why would I need a circular saw"? Well, if you find yourself needing to cut lumber ─ and you don't have a chop saw or a tablesaw ─ a circular saw can be a handy alternative. Case in point, a few years ago I built a 10' x 12' storage shed in my backyard. Now, I have a chop saw and a table saw, but it was much more efficient to set up saw horses and cut everything next to the build site with my circular saw. The "circ" saw is a power tool that’s small in stature but big in "can do" attitude. Its versatility lies in its ability to both rip and crosscut lumber to the size you need it to be. Like everything in life, you have choices ─ you can spend $50 or you can spend $350. Don't worry about the price tag, for now we will stick to the basics. The photo above shows you all the important components of the saw. The laser being the exception, all saws will have these components. The differences will likely be in materials used and build quality. As for the laser, if the saw doesn't have it, it's not a deal-breaker. You can always watch the cut alignment notch to ensure straightness and accuracy when cutting. 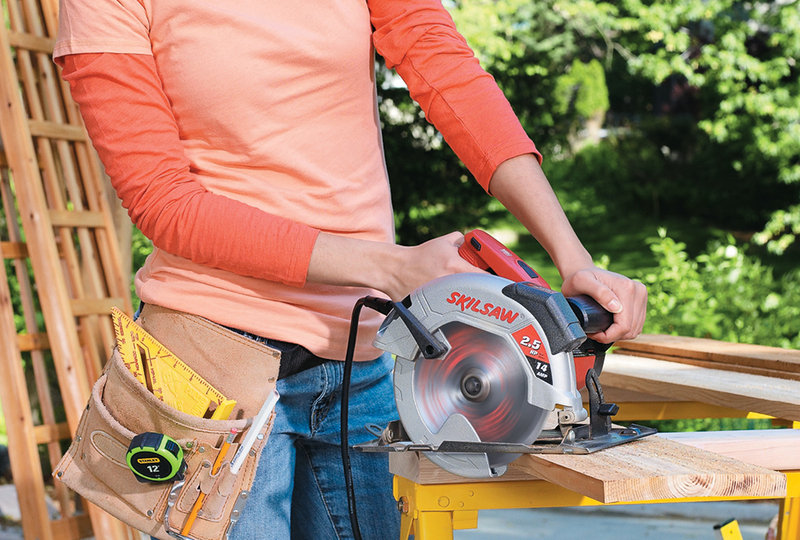 So here a few things to keep in mind when you're at the home center and are looking at a variety of circular saws. Fit & Comfort: How does the saw feel in your hands? Is it comfortable? Does it feel balanced? Or does it feel bulky or too much to handle? You’ll be using this saw a lot, so you want to buy a saw that’s going to be a good fit for the long haul. Trigger Finger: Can you operate the trigger and the safety switch easily? This is important but shouldn't be an issue. But then again, hands are not all made the same. Depth Adjustment: Is the depth adjustment lever easy to reach and operate? This is another important one, as you will access this lever and adjust the depth each time you cut a different thickness of wood. Bevel Gauge: Is the bevel gauge easy to operate. You won't use this feature near as much as the depth adjustment, but it still needs to be functional for you. Power Capability: Does the saw have enough HP/AMP for your intended uses? Most circular saws use a 7 1/4" blade, and it's quite likely you will be cutting 1/2" to 3/4 " material most of the time. Most saws will be able to handle the load, but the bigger the motor the less stress on it and the longer it will last. And with more HP comes the ability to cut thicker lumber more efficiently. As another FYI, the circular saw was the second tool I bought when I entered the world of DIY. My first was a sliding compound miter saw. But I soon realized I needed to cut beyond the capacity of that saw and quickly added the circular saw to my "tool stash". This is just a brief overview, so stay tuned in the weeks to come for even more information about circular saws. Here’s what you can look forward to! In Circular Saws 102 we will cover saw safety and blade basics. Plus, why you might need more than one blade. In Circular Saws 103 we'll discuss tips and tricks to ensure accuracy.